When it comes to purses, there are a few that remained in history for their exquisite design and the popularity they gained when they first appeared. One of these timeless classics is Chanel 2.55 handbag which is considered a luxury handbag and has been praised by many fashion critics. It was designed in 1920, when Coco Chanel wanted to create something that would be more comfortable to carry around. Until then, handbags were carried in the hand and only workers had straps on their handbags that allowed them to use their hands or carry heavy items. Fortunately, Chanel, who really got her inspiration from everybody around her, managed to create this beautiful handbag that had straps and was much easier to carry around. She got her inspiration from soldier’s bags and managed to develop the finished product in 1929, but it was recreated in 1954, under the name of Chanel 2.55 handbag. 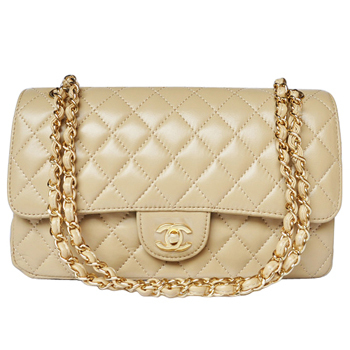 The bag, as you would probably imagine, is well crafted and beautiful with the Chanel classic elements. It has a lot of symbols and elements that make it even more interesting and create nice stories behind this concept. For example, it has a lining of burgundy color which it is said to represent the colors of the uniforms that she used to wear at the convent, where she grew up. There is also the fact that she created a zippered compartment inside the front flap and a lot of people have speculated that it was supposed to be used to carry love letters. Chanel definitely thought about everything a lady needed when creating this handbag. The double shoulder strap was to enhance social activities and make the woman walk freely. Some other features of this beautiful handbag include: having a quilted diamond or herringbone pattern on the exterior, a beautiful lock that was called “the Mademoiselle Lock” and it also seems that the beautiful chains were similar to the ones carried by the caretakers at the convent where she grew up. There is no doubt that this beautiful handbag is quite a view and it would probably be the perfect accessory when you want to invest in something that can be used for years and years.